** This image file was slightly revised and updated on 8/4/16. 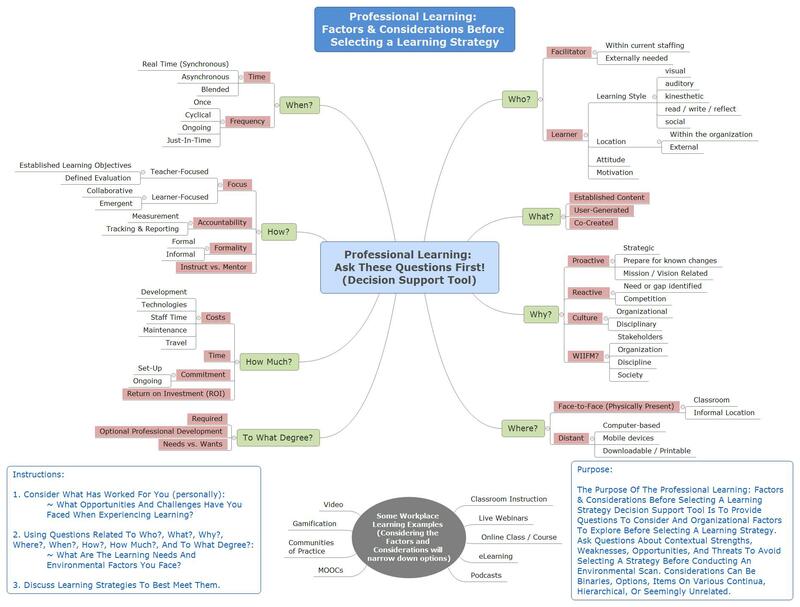 It is now titled: Professional Learning: Factors & Considerations Before Selecting a Learning Strategy. I have a task request in my professional work (I work in Training and Knowledge Management), and have been wracking my mind as to how to approach this, that I am at the point I need to get some feedback. Would love some thoughts on this if anybody is so inclined. There was a request to provide an overview of learning options we can select related to a potential need to develop a learning community. Rather straight-forward, though each time I looked at the breadth of options for this, other options and considerations arose. For example, the notion of build it and they will come is only a nice notion, though those of us who work in workplace learning know it is not quite that simple. In fact, there are so many considerations related to this that thinking about the end result (threaded discussion like a Discourse install, an open, collaborative, knowledge-building learning and sharing experience like CLMOOC, or even through the structured Canvas elements for something like the #HumanMOOC) is premature without considering. Why even daydream about a large system if there is little budget, or consider a mooc if there is not staffing to support it?